American record holder Galen Rupp won his sixth straight U.S. title at 10,000 meters at the 2014 USATF Outdoor Championships at Sacramento's Hornet Stadium in 28:12.07. After a pedestrian 14:37 first 5000, which was led by Hanson-Brooks’ Jacob Riley, two-time U.S. cross country champion Chris Derrick got the real racing going around the 5200 meter mark and the race soon turned into a five person affair – Derrick, 27:41 man Aaron Braun, Rupp, Sean Quigley (27:50 pb) and Ryan Vail (27:44/2:10 marathon). Over the final 7 laps, it was a two-person affair between Derrick and Rupp. Rupp bided his time until 500 meters remained and then he made his move. Derrick had no response and at the bell Rupp already led by ten meters; he cruised to a dominant victory thanks to a closing 800 of 2:03. Rupp ran a 27 first 200 on the last lap and then just cruised it in for a 60.39 final lap. 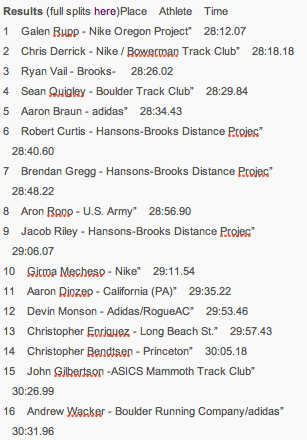 Derrick ended up second in 28:18.18 with Vail in third in 28:26.02 as Quigley and Braun were 4th and 5th. Rupp Sets Record For Most USA 10,000m TItles. This is Rupp’s 6th consecutive victory which breaks the record as he was previously tied with Frank Shorter at five. Shorter won in 1970, ‘71, ‘74, ‘75 and ‘77 (although to be fair to Rupp he should have already had the record as Shorter tied for 1st in 1970).